Sunday June 4th 10pm, 10 Native Actors and Actresses performed sketch comedy at the iO West Comedy Club in Hollywood. Thanks for the great work! Sponsored by Council District -13 and City of Los Angeles Councilmember Mitch O’Farrell. This showcase was established in 2013 to highlight talented Native American actors and actresses who want to further their careers and desire more exposure at the network and studio level. Typically, Native Americans have limited access to these types of opportunities. In addition to supporting the actors, this type of showcase helps erase stereotypical portrayals of Native Americans by depicting our community in a new, original, and humorous manner. The goal of the showcase is to offer new opportunities to the many talented Native Americans looking to expand their professions and take the next step in their careers. The showcase participants will have greater experience, more exposure and know more industry professionals. Most importantly, this showcase fulfills the mission of the LA SKINS FEST by creating a conduit between the Native American community and the entertainment industry. 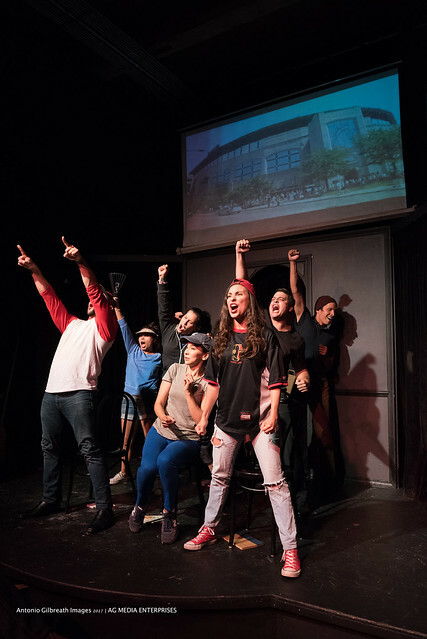 Our inaugural showcase took place November 13th, 2013 as part of the 7th Annual LA SKINS FEST and was sponsored by FOX AUDIENCE STRATEGY. Our 2nd Skins Sketch Showcase followed in Spring of 2014 and featured an all Native female cast sponsored by NBCUniversal.